This is the primary riding formation. Single file is used when directed by the ride leader. 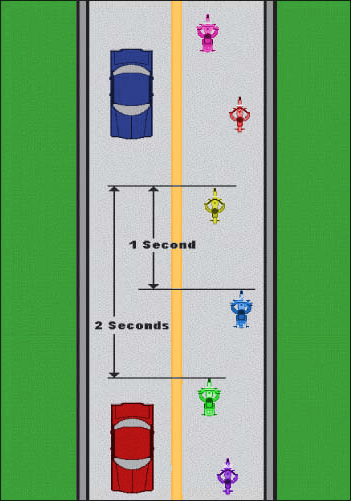 One-second rule: the bike in the lane to your left or right should not be less than one second ahead of you. Two-second rule: maintain at least two seconds between you and the rider in front of you. Four-second rule: look ahead four seconds at your immediate path of travel to give yourself more time to react to a hazard. Twelve-second rule: also look ahead at your anticipated path of travel. Twelve seconds is approximately one city block.